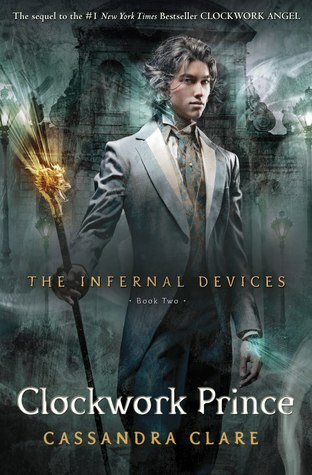 Author Cassandra Clare takes us back for a second round. In her highly anticipated book Clockwork Prince.Set back in 19th century London. Over 150 years before The mortal Instruments. I must say I devoured this book in one sitting. As always I am sucked into this world. That Mrs Clare has created for us. The world of the Shadowhunters is amazing. I am always left with wanting more. Clockwork Prince made me laugh,cry, and want to throw the book across the room. I was literally on a emotional roller coaster. In this book I feel Tessa has really grown as a character. Shes not just the hopeless girl from New York anymore. She has truly come into her own skin. And others as that may be lol. While they still must face off against those Clockwork creatures. There are many other parallels they are up against. New romances,deceit,lies, and decisions must be made. This book made me see Will in a totally different light. He is not just the handsome,dark haired, blue eyed shadowhunter we all know and love. He has a totally different side to him. One that even Jem didn't know still existed.I definitely recommend this book. For those who haven't read this series yet. What are you waiting for? I am totally invested in this series. I can hardly wait for Clockwork Princess to come out. Which is suppose to debut March 2013. My only advice is that you have a box of Kleenex near by. Your going to need it!